Dave O'Brien reports on the 2006 NAS Oceana Air Show, which took place on September 8-10, 2006. The show featured the last F-14 Tomcat airshow performance, Super Hornets, and the Blue Angels. I was looking forward to this airshow all season, it was my first time at Oceana, a Master Jet Base. This airshow was not only a salute to 60 yrs of the Blue Angels, but the final flight of the F-14 Tomcat and the unit VF-31 Tomcatters. 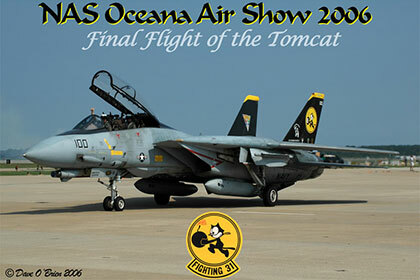 After this the Tomcat will be retired and flown to the boneyard or museums for display. A friend and I made the 12 drive through Wednesday night, arriving in Virginia Beach around 9am to see Hornets flying the pattern. It was such a sight. We spent Thursday outside the fence watching the arrivals of the statics and display teams. In between you could catch the hornets using RW5 for pattern work. We stood at RW23 with many others watching the Blues out taking their marks for their practice later that afternoon. It's always cool listening to the pilots talking about reference points between the two solo's and then the Lead and another of the 4 ship pilots planning their entry points and exit points. We caught a F-15D and F-16B from Eglin's 46 TW, F-22 from Langley, F-15C Demo team also from Langley, C-2 and C-130 and after the first F-117 we called it quits Friday was going to be a long day. Friday's weather wasn't great, some high thin clouds kept most of the sun low. We walked along the Hot Ramp where the pilots of the Fleet launch would walk to their aircraft. To see the line of Hornets, Super Hornets and the remaining Tomcats was a thrill. To ramp was filled with crews prepping the planes and then walking around with the pilots to look over the plane again before starting up. While the Fleet was taxing to the runway, a E-2 Hawkeye Demo from VAW-120 flew into the pattern to perform. He would land and pull his wings back to taxi, this would be used to save room if he was on a carrier. With his wings locked back in place, he was ready to lauch for the fleet aircraft could take off. The Super Hornets from VFA-11 took off first, 2 singles and then one pair. The F-14s took off next, the pair took from from the runway closest to us 5R, while the two singles used 5L. The C units were the VFA-34 & VFA-87 which took off last and meet up with the rest of the fleet to form up. The F-104 took to the skies for many passes, this is simply a missle with wings. The C-130 from Michigan ANG had snuck out with the US Army's Black Daggers and British Red Devils parachute teams. Once the F-104 landed the two teams jumped form the Herc with both the British and American flags. Once they were all down the Fleet Aircraft Flyby was cleared in. This was a site for me because I've never seen 12 aircraft in such a tight formation before. Just as the Fleet were starting to pass the end of the runway, a F-18F SH would pull a tight sneak pass catching everybody's attention! The F-15C demo took to the skies next and then Dale "Snort" Snodgrass in his F-86 took off to join up with him. This was another "first" for me seeing Snort fly the Sabre. The F-18C demo went up next followed by the Heritage flight with the Corsair and Avenger. The F-18F Super Hornet demo came next, I was really amazed how this Super Hornet could move around the skies just throwing the aircraft around almost like the Raptor. Patty Wagstaff followed in her Extra 300, it a shame so many of these acts don't make it up to New England. After Patty had landed, Fat Albert took off followed by the Blues practice. The night had just started though, as Oceana puts on a Evening show starting at 5pm. The Hawkeye came back and then the F-18C demo took off. The Geico Skytypers in their T-6s were followed by Greg Shelton. The F-15 and Snort launched again for the dusk flight, then Fat Albert had the box for their JATO take off. Ken Fowler followed with Rocket Aerobatics then the two parachute teams dropped out of the C-130 again with glow sticks attached to their suits. A F-18 launched to light up the night sky with his afterburners, Bill Leff in his T-6 had a Starshow. When he was done he raced the Shockwave Jet truck and a huge wall of fire lit up the night by Rich's Incredible Pyro team. The Night ended with Firework over the runways. Saturday morning we awoke to beautiful weather, sunny with a few clouds to break up the blue skies and temps in the low 80s. The show was only a little different from Friday, Patty Wagstaff went up for a quick morning warm up followed by the Geico Typers, Greg Shelton and the Blue and White L-39. It was time to next launch the fleet aircraft. Dale's F-86 had a problem after Friday nights flight so he was down for the weekend. They had the F-104 fill in his slot in the airshow which was great. The two parachute teams were picked up by a Stallion on the east ramp and flew behind the crowd and climbed to 10,000 feet to drop for the National Anthem. The air fleet fly by was next and this time I was ready for the sneak pass of the Super Hornet. Perfect vapor was pouring off it's wings as it knifed by the crowd. When the tactical demonstration was up, we were treated to the same vapor shots as each Hornet and Tomcat pulled to the left or right after their break. One of the added features was the F-117 demo, we were treated to some nice passes where the pilots banked the aircraft to get some nice top side shots which is the normal passes for this aircraft. A huge thanks for the crew to pass on some thoughts put out by a few friends looking for something different. Dan Buchanan flew a glider pulled by a truck so he could get some height. The amazing thing about Dan is he's a paraplegic caused by a sporting accident, but it hasn't stopped him. Greg Shelton had gone up again but this time with a wing walker, her name was Ashley Battles. The rest of the show was followed with the F-15C demo, USAF Herritage Flight, both jump teams, Ken Shockley, Patty Wagstaff, the Super Hornet Demo and finished up with the Blues. Another thing NAS Oceana does is a night burner show on Saturday night along the beach. We walked towards the Neptune staue and could see the Tomcat circling closer to the base. Around 8pm the Tomcat was cleared in for his burner pass. He came straight over the Hilton with both burners maxed, pulled a 360 and climbed straight up with his burners on until he hit the high clouds when he cut them off. It was a nice touch to a great ending of one of our best Naval Aircraft. The C-130 came in up high and the jump teams came down with the bodies lined with glow sticks. They looked like aliens dropping from the sky. As they circled over head and then landed on the beach, the kids when running in to see if they could get a glow stick. Even though we had a 12 hour drive ahead of us, we wanted to see the the Tomcat fly one last time. We went to show just to catch the Fleet Flyby and tactical demo and then head out for our long drive back to NH. I really hope I get back down to Oeana for another airshow, it's easily a "MUST" airshow to hit once in your life. I want to thank NAS Oceana and their Public Affairs Office for the media access on Friday.